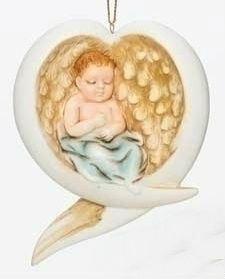 A baby nestles peacefully within an angel's wings. This is a lovely porcelain ornament. I like the idea of baby Jesus being held by an Angel. This could also be used for an ornament for a new born baby boy. Very well done.